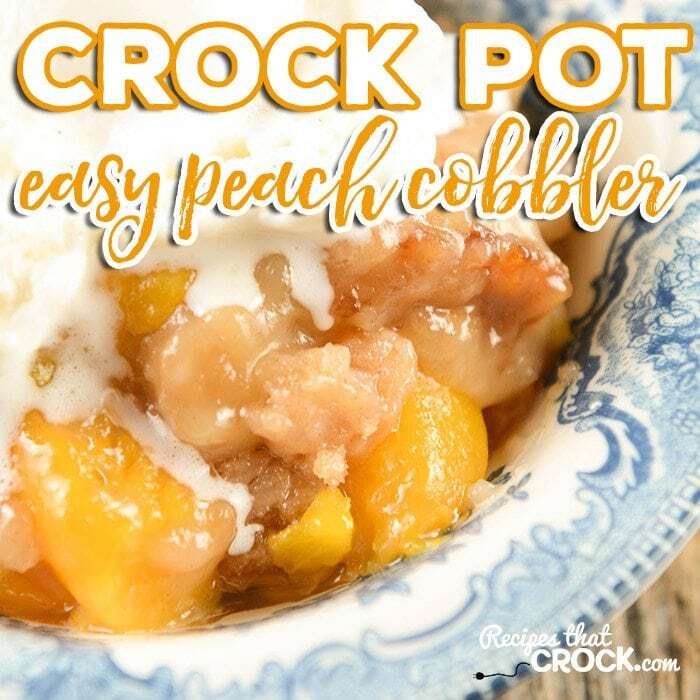 Easy Crock Pot Peach Cobbler - Recipes That Crock! Are you looking for an easy fool-proof crock pot dessert? 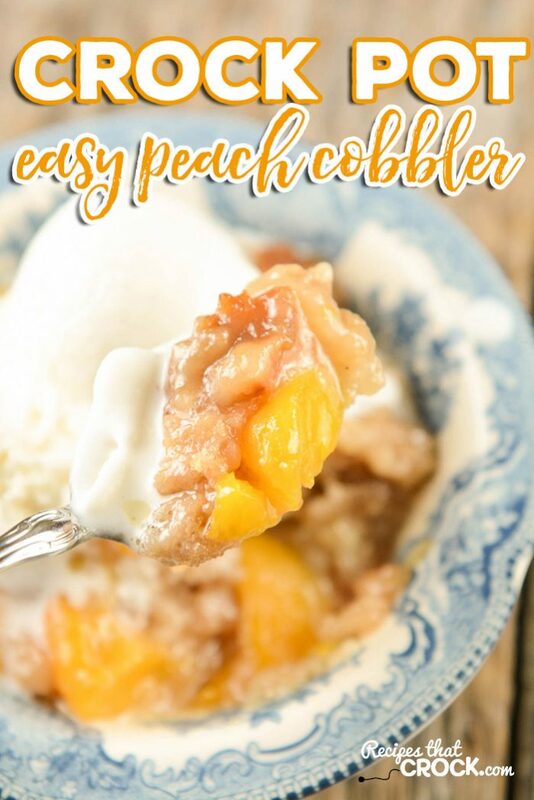 Our Easy Crock Pot Peach Cobbler is simple to make and absolutely delicious to eat. You will be shocked at how easy it is to throw together! Cris here. I have to confess… I thought I had put this recipe up on the site ages ago. But, when I went looking for it this weekend it wasn’t there! So, I had to remedy that immediately. This is one of those GREAT recipes that you can keep all the ingredients on hand and whip up anytime you need it. Now… you may be saying to yourself… “Self, didn’t she just share this the other day?” Nope. I shared an Easy Crock Pot Peach Crumble the other day– using the same bowl ( I REALLY like the bowl, okay? )– and so it may look familiar, BUT the taste and textures are completely different. We used Peaches in Heavy Syrup- You can use light syrup versions but I haven’t tried just juice. We crock this up in any of our 6 quart slow cookers on a regular basis. Make sure your baking powder has not expired. Fresh baking powder is essential to this recipe. The way you put this recipe together feels all wrong, but follow the steps and it will turn out just perfect– promise. Spoon peaches and syrup on top of the batter-- do not mix. Set slow cooker on high and cook for 1½ - 2 hours OR until top of cobbler is set. Note: If you have trouble viewing this video, click below to watch on YouTube. Can this recipe be doubled in the slow cooker? I tend to prefer to just use two slow cookers when it comes to “baking” in the slow cooker. Otherwise it is hit or miss on whether it will get done in the center. Mouth melting! I would truly enjoy a warm serving of this luscious dessert with ice cream. So happy you shared with us at Weekend Potluck. How long would I need to cook it n the rectangular crock pot? It would likely take the same time… but I would cook it in a 6 quart if it were me. The cobbler part will bake up nicer in a 6 quart oval because it can grab the sides easier. But if you really need to cook it in the casserole, it will likely take the same time, maybe just a little longer.